The classic Italian dish revamped in bread pudding form. Sauteed eggplant, fresh tomatoes, basil and mozzarella tucked into loads of crusty bread. Melt the butter in a large saute pan over medium heat. Once butter is melted, add the bread and toss to evenly coat. Let bread toast in the butter until golden brown, tossing occasionally to make sure it browns evenly, about 8 or so minutes. Place finished toasted bread cubes in a large mixing bowl and set aside. In the same saute pan, heat the olive oil over medium. Once oil is heated, add the eggplant and then the garlic, tossing to combine and evenly coat. Saute until eggplant has softened slightly, again about another 8 minutes or so. 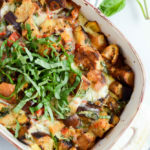 Add eggplant mixture and remaining ingredients (except for additional basil to garnish) to the large bowl containing the bread cubes and toss to combine. Pour mixture into a medium sized casserole dish and bake in oven for 30 minutes. Towards the end of the cooking time, keep an eye on the bread pudding to make sure the top is not getting too brown. Somewhere between 25 and 30 minutes, depending on how hot your oven is, turn the broiler on high. Bake for an additional 3-5 minutes, or until the cheese on the top of the dish is golden and bubbly. Remove and let cool just slightly before serving. Best served with a large green salad.